You can log any data or information available in mySCADA. For user convenience and easy access, data are grouped in the data-logs. You can think of a data log as a collection of similar data. It might be, for example, a set of temperatures read each second from the PLC, motor start-up voltage and current logged every 100 milliseconds, the running hours of machinery, operator actions, or computed production statistics. You can also log any user-defined variables from Server-side Scripts via a virtual PLC. Data-logs: data sets grouped together. 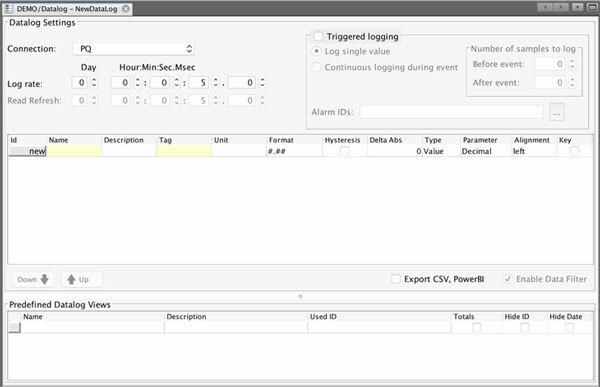 Each data log has a set of parameters, such as log period, pre and post event buffers, and so on. Data logs are defined by the data you wish to read and log. Data is the collection of data points. 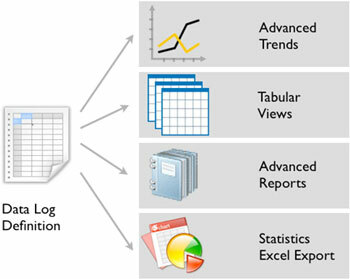 Data points can be variables read from the PLCs, user-defined variables, and computed statistics from Server-side Scripts. Data point: can be either a numerical value, string, or date. Numerical values can be of any numerical type such as Boolean, Integer, Float, Double, Signed, or Unsigned. Numerical values are always automatically converted and logged as double values. This way you do not have to worry about the data type and its conversions. Continuous Data-logs log periodically without interruption; this type of data log is useful mainly for persistent processes. Triggered Data-logs is dependent on some event/condition. The condition is specified by the alarm ID (or multiple alarm IDs). This type of data-log is useful for repetitive or random processes where you can specify the triggering condition. 1. Go to the Data-Logs section in the Project Window, right-click on the Data logs, and select Add New. 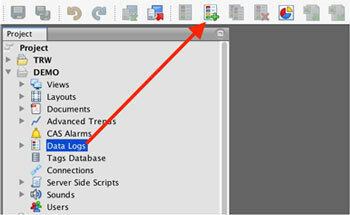 You can also use the button “New Data-log” in the main toolbar. 2. A new dialog window will show up; fill in the data log name and click on OK.
3. Double-click on your newly created data-log in the Data-Logs A new definition window will show up. It is split into two horizontal sections: data log definition and data log views.